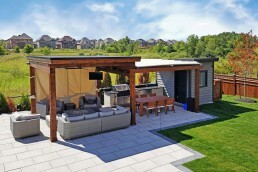 Technology has become an increasingly trendy addition to outdoor living areas. It elevates the entertainment factor, while adding to the social experience you will share with friends and family. Imagine watching the game outback while the kids take a swim in the pool. Think of how great it would be to stream music around the warming fire pit. Your backyard doesn’t have to take a backseat to the smart technologies that are making their way into your home and lives. Adding a few electronic components can make your life easier, safer and a lot more fun. 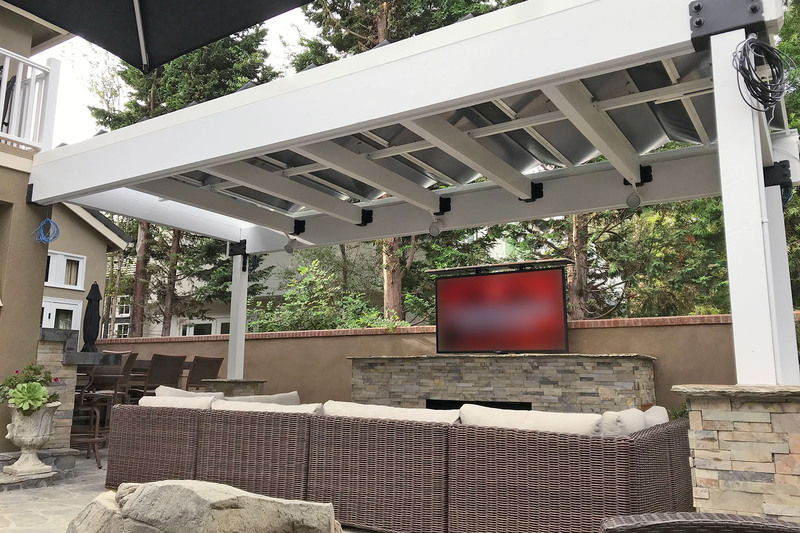 Homeowners can install a full entertainment system into their outdoor living spaces thanks to new technology. You can have waterproof speakers, portable speakers, solar powered speakers, hidden underground subwoofers and a multitude of other choices. Wireless, streaming music can flow from any location into your backyard, including the pool! But why stop at speakers? You can go big! Set up a whole outdoor entertainment system and bring a new experience to movie night. When selecting an outdoor TV, it’s important you choose one resistant to natural elements, both day and night. Make sure that it is weatherproof, impact-resistant, and operable in cold and hot temperatures. Look for TVs which displays are designed for exposure to sunlight. This way, it can provide a superior picture under any outdoor lighting conditions. Remember to keep the noises at a reasonable level for the sake of your neighbors. Having a covered deck is a must. Installing a retractable canopy is a great addition all around. Not only will it protect that new entertainment system you put in, but also the people sitting around it. With ShadeFX Retractable Canopies, there is the option of having a motorized system. Meaning, you never have to get up from your chaise lounge when the glare is too much for the TV. With one push of a button, your canopy will extend giving you both complete coverage from the sun. For that extra techie touch, order your new canopy with the myLink App. It’s an app that enables users to control their canopies from their phone, including setting timers to suit your schedule. Its remote access guarantees that even when you’re away from home you can operate your shade with a single tap. When it comes to rain, no problem. ShadeFX’s single track design allows for unparalleled coverage, ease of deployment and unrelenting protection from both the sun and rain. 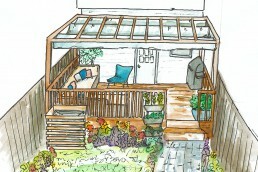 This unique design allows the rainwater to flow off of the sides, with no pooling in the middle of the canopy. 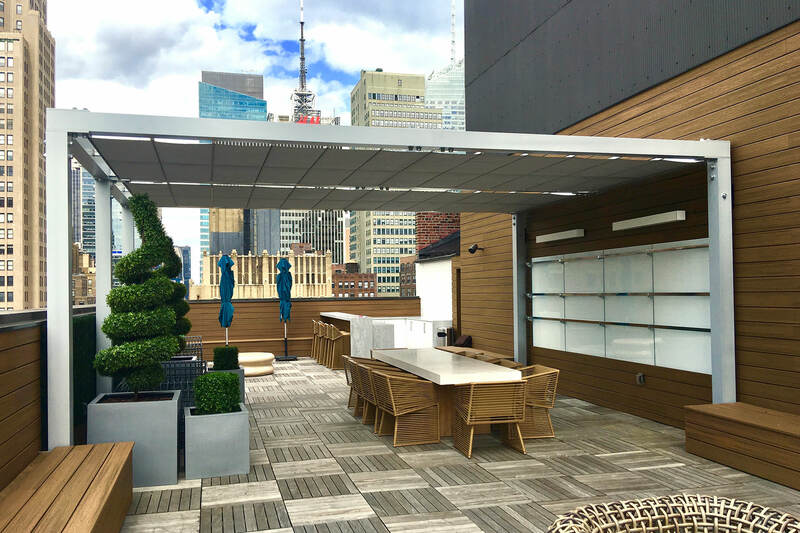 With high UV rated and water repellant fabrics to choose from, your motorized canopy can be customized to fit any outdoor structure. The fun can continue long after the sun sets. Enjoy your outdoor entertainment area at night by installing a custom lighting system. LED lights are currently the most sustainable, durable and environmentally friendly. These types of bulbs are available in a wide range of colors, styles and beam spreads. In-Lite Designs offers a variety of LED lights that are suitable for all types of outdoor uses. You can mark a path with soft lighting or emphasize a tall tree with a powerful beam. In either case, the lights allow you to illuminate your entire outdoor space right down to the pool. Custom lighting solutions can be integrated into your overall control system, making operation as simple as a single touch. Alternatively, you can pre-set a timer that adjusts to dusk and dawn year-round. When summer ends and you start to feel a chill, outdoor heaters can keep you and your family comfortable well into the fall. 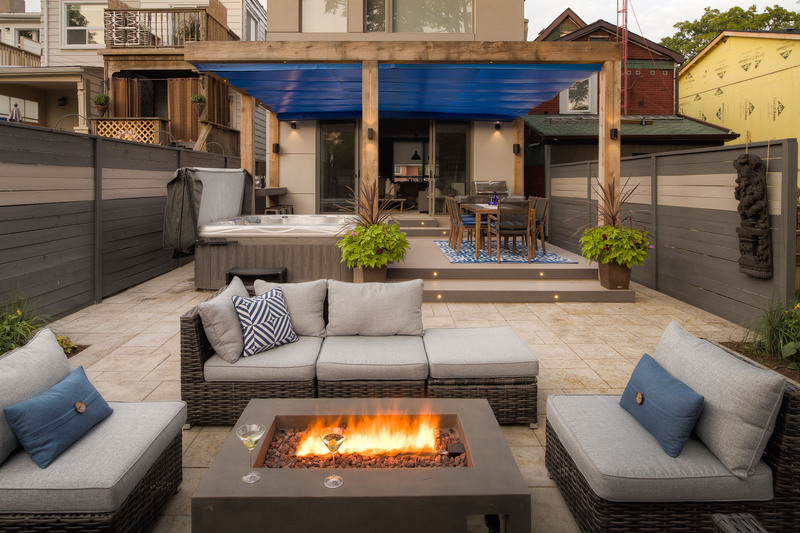 Backyard fire pits have never been hotter, while outdoor fireplaces are becoming increasingly popular backyard additions. Fire pits, in particular, are relatively inexpensive and create a focal point for backyard relaxation. It’s the perfect place where everyone can get together for quality time. You can catch up with friends, roast gooey s’mores, drink glasses of wine and have a great time. For heating larger spaces and keeping you toasty and warm, patio heaters are an excellent solution. Surely, you’ve already seen the free-standing mushroom-shaped heaters on restaurant and pub patios. 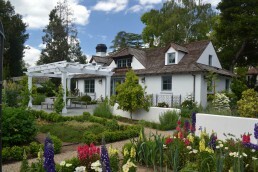 There are a handful of varieties and styles that run on propane, gas or electricity. 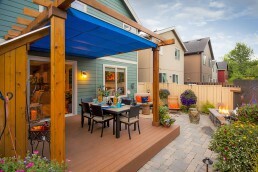 Certainly, current technology has the ability to make your backyard everything you want it to be. Whether you are looking for your backyard to be a calming oasis or party central, there are new products out there to help you make the most of your outside space. Start with your remote-control canopy. We can help.